to international superstar in a deeply personal new book. he award-winning artist explores the highs and lows of her remarkable life in an alternately funny and heartbreaking memoir. Taking readers behind the scenes of her biggest career moments, Newton-John, 70, offers intimate access into her personal life, zeroing in on the experience of surviving three bouts with breast cancer and her dedication to charity and advocacy. The book's message is simple but powerful: Never give up on life. The actress and singer goes deep into a trio of pivotal periods from her book. 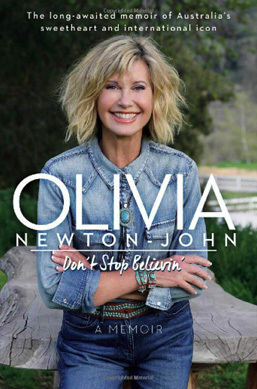 A good chunk of Newton-John's memoir focuses on her humble beginnings; she grinded in the music industry for years before landing the role of Sandy in 1978's Grease. "I'm grateful that I was prepared for it, [that] I had many years in the business before that," she says. "I was 29. I started when I was 15. So it was almost 15 years of working before. I was ready -- it wasn't a big shock being overwhelmed." "I wasn't sure about it!" Newton-John says of her 1981 album's smash-hit title track. "I recorded it, then I had a panic attack, [thinking] it was too raunchy... I say in the book: Two of the things I was nervous about turned out to be my biggest successes. One was Grease; the other was 'Physical'. Not to say you should always do things you're scared of, but in this [case], both challenged my fears." "When I first had breast cancer in 1992, I decided to talk about it, and it opened up a new world for me," Newton-John says. She was one of the first entertainers to go public with such a diagnosis. What motivated her to reveal it -- and, in turn, become an advocate -- is what also prompted her to discuss it in the book. "There's so much nonsense written about my experience. So I just decided to write about it." 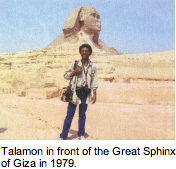 Bruce Talamon was one of the few lensmen capturing the golden age of '70s sound. With the new book 'Soul. R&B. Funk.' showcasing his work in full detail, he reveals the story behind this iconic Bootsy Collins portrait. his was one of the early sessions that we did with a background and strobes and lighting. We would create a lighting studio wherever we went. We were mobile. We would stuff that crap into my little Fiat. Bootsy loved it, because nobody was doing that for him. He had a ball. He played for us. You should see the stuff that I didn't get in [the book]. I did close-ups on his hands, on the strings. Oh, baby, that s--- was nasty. It was wonderful. We would treat [artists] like kings and queens. They loved that, they appreciated that. But what could that mean? That meant that Bootsy stayed longer than he needed to. We would shoot maybe 10 rolls of black and white and five rolls of color. We didn't need all that, but they were standing in front of things [saying], "Do you need some more?" "Hey, man, I could change into another outfit." 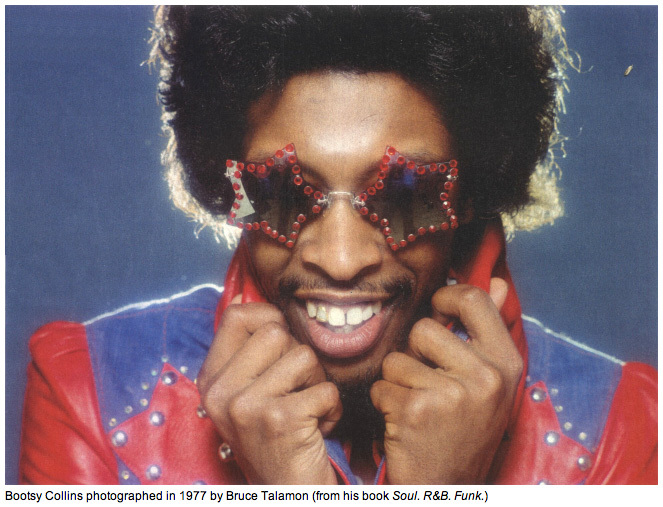 Bootsy did three f---ing outfit changes. He was just cool. A lot of people have asked me, "Well, why now, why this book about African-American music?" It was marginalized back then. Yes, there were photographers shooting the Jackson 5 or Diana Ross, but they weren't shooting Billy Paul. They weren't shooting the Isley Brothers. They weren't shooting Harold Melvin & the Blue Notes with a young Teddy Pendergrass; they photographed Teddy Pendergrass later. We were the ones that were documenting all this.